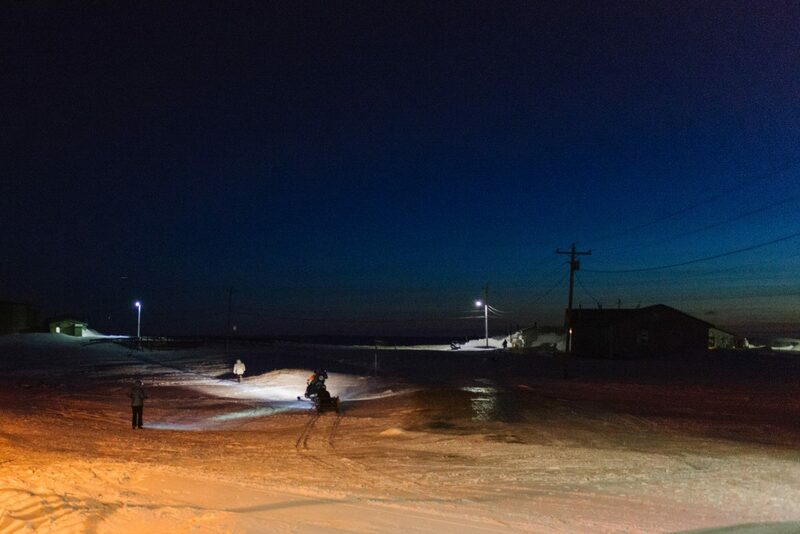 A grassroots guard learns how to keep people and polar bears safe in a small Arctic community. Deep twilight settles in over Wales, Alaska. As the last traces of sunset orange give way to blue black on the western horizon, the icy Bering Strait and Siberia beyond are invisible in the night. All is quiet in the tiny village—a cluster of buildings with a single string of streetlights, tucked between frozen hills and frozen sea. Roughly 200 meters from the beach, a large white shape moves in the shadows between the post office and a snowdrift as high as a house. Suddenly, a snowmobile appears out of the darkness, headlight beaming, heading straight toward the lumbering shape. The two men riding the machine shout and wave their arms in the air, swerving back and forth. Into the light steps a polar bear. The driver revs his engine, and his passenger yips and hollers, standing tall, waving a high-powered flashlight at the bear. The bear huffs, and for a moment looks like it might hold its ground. Instead, it drops to all fours, turns, and runs around the building. The men on the snowmobile follow, still kicking up all the noise they can muster, driving the bear toward the ocean. In the distance, chained dogs start to bark in chorus. Once, twice, three times the bear stops and turns to face its pursuers. But each time, the men keep coming, their breath steaming in the icy air. The pursuit stops abruptly when the bear and the men reach the beach. Then the “bear” straightens up, adjusts his bulky white jacket, and climbs into a trailer hitched to the snowmobile. 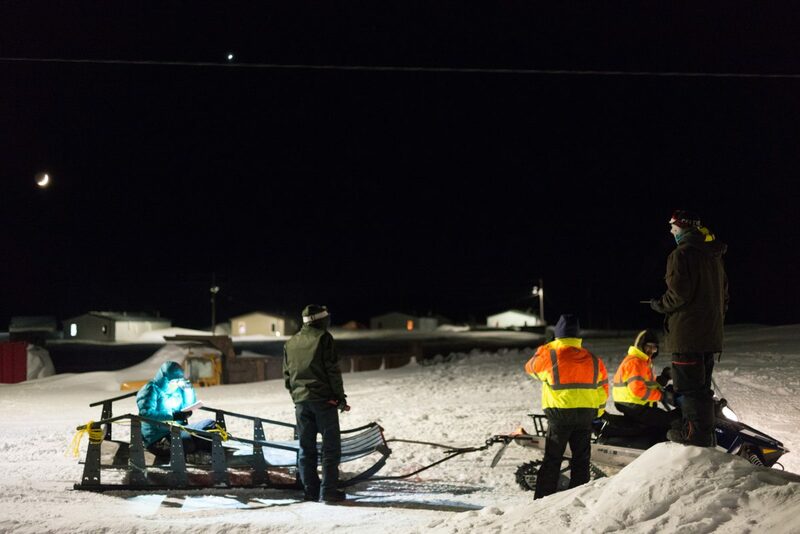 The Kingikmiut Nanuuq Patrol has just completed its first practice run of the season. The two-year-old Kingikmiut Nanuuq Patrol—or the Wales polar bear patrol—resulted from an innovative partnership between the tribal council in Wales, US government wildlife officials, and the World Wildlife Fund (WWF). (Nanuuq is the Inupiaq word for polar bear. Kingikmiut, the Inupiaq name for the people of Wales, means “people from the high place.”) The patrollers are trained to haze visiting polar bears out of town using an escalating range of non-lethal deterrents, from flashlights and air horns, to a shotgun loaded with beanbag rounds or rubber bullets. They carry a second shotgun loaded with live ammunition as a weapon of last resort, but ideally the operation delivers a warning for the bears, not a death warrant. The goals are simple: to keep people safe from bears, while also keeping bears safe from people. 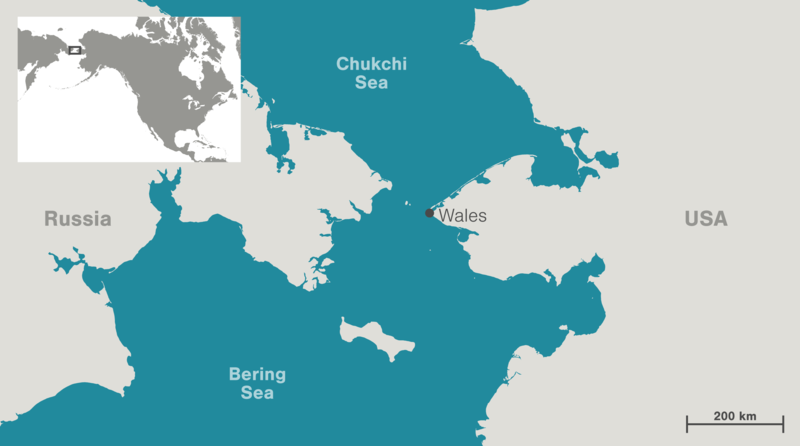 Wales, home to roughly 150 people, sits on the westernmost point of mainland North America, just 80-odd kilometers from Siberia’s Chukchi Peninsula. (It is one of a handful of places in Alaska where you can, in fact, see Russia from your house.) Polar bear season in the village usually lasts from December to May. The timing is variable and dependent on ice conditions since most of the bears arrive by crossing the frozen ocean from their dens on the Russian side. Those that venture into town have generally wandered in along the beach. Because the main road through town tends to fill in with tall, impassable snowdrifts, the windswept beach is also a route that the village kids take to and from school. A few years back, two of the community’s teachers had a close encounter on their way to work in the winter darkness, and for the Kingikmiut, the ultimate nightmare scenario is a confrontation between a polar bear and their children. At the same time, the traditional solution to bears in the village—shooting them—no longer seems ideal. 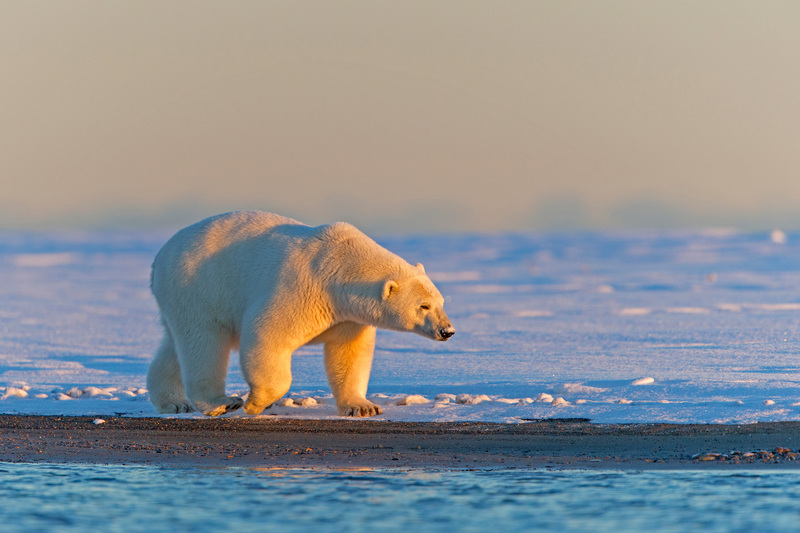 Elsewhere in Alaska and Russia, patrols have been launched, as Elisabeth Kruger of the WWF puts it, only after “something bad happens.” Kruger is the organization’s Anchorage-based senior program officer and much of her work across Alaska’s vast northwest is focused on polar bears. On the Chukchi Sea, where one of the healthiest polar bear populations is located, she and the Kingikmiut wanted to be more proactive for the sake of the bears and the community. Oxereok, 58, is one of a half-dozen men who volunteer their time for the patrol. “I was fortunate enough to learn from the elders at a young age,” he says. A Wales lifer, he’s hunted bearded seals, the village’s dietary mainstay, as well as walruses and muskoxen. He has also taken three polar bears during his lifetime, and chosen to let many others go safely on their way. He was taught that the bears present themselves to the hunter, and then it’s up to each man whether or not he pulls the trigger. He first met Kruger through Alaska’s Nanuuq Commission, a polar bear management and conservation organization for Alaska’s native villages. In 2014, Kruger was gauging the support for the possibility of a new patrol program in eight Arctic communities. Oxereok, representing Wales, was most keen. The program got off the ground in the late winter of 2016, as bear season was winding down for the year. Kruger and a representative from the US Fish and Wildlife Service traveled to Wales to meet with the team members for training and planning. The patrollers—Oxereok, his brother Stanley, two of their nephews, and two other young men—acquired their gear: a snowmobile and toboggan, safety supplies, and an armory of bear deterrents. They hashed out goals, roles, and principles, and the new program began to take shape. Now underway, their aim is to make regular sweeps of the village at peak times during bear season: primarily before school, and sometimes after school and in the late evening, when public hours end at the school gym. They are also on call to respond to bear sightings reported by residents. Polar bears, of course, have become a potent symbol of the cost of climate change. Al Gore’s An Inconvenient Truth seared the image of a polar bear paddling, paddling, paddling hopelessly in search of the vanished Arctic pack ice into minds around the world. But overall, the bears aren’t yet on the brink. After outsiders seeking trophies drove overhunting in the 1950s and 1960s, a 1973 treaty, the Agreement on the Conservation of Polar Bears, was signed by all five countries in which the bears are found: the United States, Canada, Norway, Russia (USSR at the time), and Denmark (via its relationship with Greenland). The agreement significantly limited polar bear hunting and led to a rebound. A 2017 report from the Polar Bear Specialist Group at the International Union for Conservation of Nature indicates that only one of the world’s 19 regional polar bear populations is definitely declining. Two are increasing, seven are stable, and the remainder lack sufficient data for a conclusive diagnosis. The threats posed to the bears by climate change are real and growing, but can be difficult to articulate. In some communities, that’s led to a disconnect between conservation groups and residents for whom bears are more menace than victim. In the “south,” Indigenous groups and conservationists have often been natural allies, but in the Arctic, where Inuit communities have traditionally lived off the meat of whales, seals, and walruses, it’s been a different story. Many outsiders view the killing of a marine mammal as an act of barbarism, and Arctic communities don’t take kindly to being told that their only source of local food is immoral and off-limits. That leaves people like Kruger with the task of regaining locals’ trust and reassuring them that she doesn’t intend to come in and steamroll the villages with outsider-imposed solutions and conservation regulations. That’s why the process leading up to the patrol’s first full season, in the early months of 2017, was long and careful. Kruger is very conscious of her status as an outsider, a white woman from a global organization, and she works hard to build relationships with the people in the villages she flies into. She does a lot of listening, and aims to respect local autonomy and local concerns. 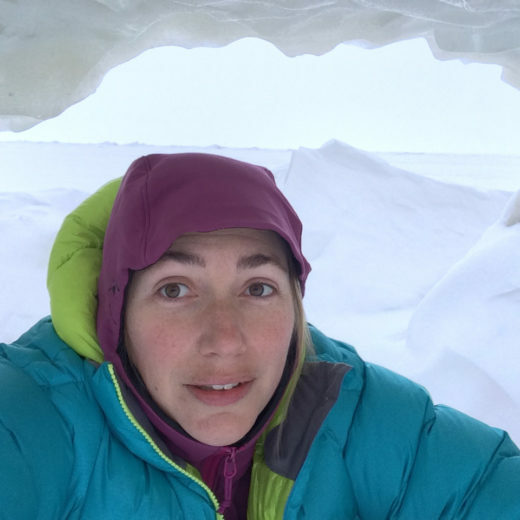 “I’m a facilitator, and an enabler, and an aggregator of lessons learned from the Arctic that I can share with people,” says Kruger, who lived in Irkutsk, Siberia, for four years before landing in Alaska. She prefers to hear from locals about what they need or want and then help provide tools and solutions for their own use. Kruger leans on a table at the front of the room, not issuing directives but simply asking questions. What worked in this scenario? What should they do differently next time? How best could the patrollers keep bystanders away? “It would have been better if we would have hazed him more towards the airport, instead of through town,” says Casey Tingook, Oxereok’s nephew. He also suggests that the snowmobile passenger carry the team’s radio instead of the driver to reduce the interference from engine noise. The discussion turns to communication and how to give the village the all-clear once a bear is gone. It’s decided that phone calls should go out to houses on the fringes of town, where the bears are most likely to appear, so word can spread naturally inward from there. The men talk through their options for another few minutes and then head back out into the darkness to face their next bear. For the second role play of the evening, Tingook pulls on the bear’s white anorak and disappears into the night. Oxereok grabs the snowmobile’s controls; his brother Stanley hops on behind him, carrying the patrol’s array of non-lethal deterrents. The brothers leave the building behind and bump along the frozen beach, checking the path that some residents use to walk home from the school gym around this time. High above, Venus shines alongside a thin sliver of moon. When they reach the school, they pause, shining bright flashlights into the darkness, scanning for tracks in the hard-packed snow or the glint of an animal’s eyes in the night. That’s when the radio mic clipped to Oxereok’s jacket squawks, and a call comes in from dispatch: a “bear” has been spotted by the village airstrip. “We’re on our way,” Oxereok says, then turns the snowmobile around and roars back the length of the village, leaving a trail of sharp two-stroke exhaust and barking dogs in his wake. Cite this Article: Eva Holland “Training the Polar Bear Patrol,” Hakai Magazine, May 8, 2018, accessed April 23rd, 2019, https://www.hakaimagazine.com/features/training-the-polar-bear-patrol/.